On Spotify, the tag ‘Come and feel the power!’ pops up as soon as you click on the name Trismegistia. Well OK then, let’s feel it! New music has a power all of its own; a new experience is always something to take time over, so I take my time listening to the two tracks currently available from this Pagan group. The first track I listen to is Hounds of Hekate. I watch the video on YouTube, and am impressed by the imagery; three ladies dance wildly, representing the three faces of Hekate, and the triple crossroads. There is a sense of frenzy in the video, echoed by the gasping breaths that emphasize the percussion. ally, this track has a sense of mystery, of wandering lost, yet with purpose. Perhaps we are running from something, or towards something. The sudden surge of strings plucked wildly gives ways to the heartbeat-breaths of the percussion over and over, not making for easy listening, but lending an air of wonder, and curiosity, even a slight darkness emphasised by the voice of the woman, and the barking of her dogs. In contrast, the other track, Nunnos’ Healing Song, is about as light and airy as you can get. Cello (synthesised) and something akin to a djembe set a gentle mood. Pan pipes announce the arrival of a familiar figure, who tells us, in the short film Nunnos which accompanies the song, that he has many names. Nunnos though is short for ‘Cernunnos’, Celtic lord of the forest, who appears in this guise as a hairy man wearing only ivy, the symbol of the everlasting woods. This ‘song’ is more like a musically accompanied guided meditation, or waking up from a dream. ‘Can you hear me? Can you see me?’ The fog of memory loss is soothed by the voice of the God. Nunnos helps and heals the protagonist, which may be a third person in the song, or maybe it’s us, the listener, being healed every time we listen to Nunnos’ soothing voice. The track ends with Nunnos assuring us we can call him, any moment. The contrast between these two tracks is remarkable, yet both are introspective, calling for inner reflection and a peaceful moment in your day. I would say this is not music to listen to on the go, or while cleaning the house, but whilst taking time for yourself, or to aid in meditation or visualization. I’m certainly intrigued to hear more of this unique musical project. ElectraChic is a German based band who released their debut album, ImPassionnément, in November of 2016. 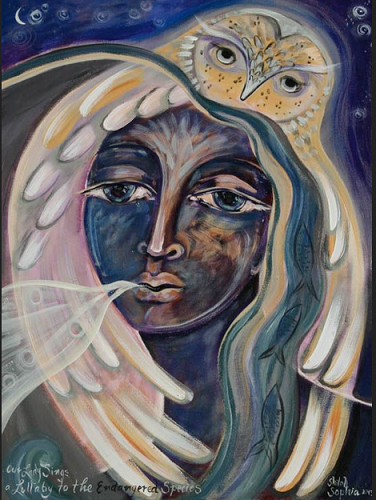 They find their influences & themes in Shamanism and through the Sacred Feminine. When it was time for ElectraChic to set out to make a video for the first song, Erde/Terre, off their new album, ImPassionnément, they did not have very far to look. Singer Annick Moerman & ian Rike Casper turned to Annick’s son, 25 year old Thomas Govaerts, a recent graduate of the School of Media. “For a couple of years I’ve also been passionate about spirituality and esotericism. During my studies I had the chance to try a shamanic journey with drums. I looked for many other practices since then (paganism, mediation, or yoga for example). About one year ago, my mother (Annick Moerman) made this album, ImPassionnément, with Rike Casper. She asked me if I could do a music video for her. I could choose any music off the album and I immediately chose Erde (“Earth” in German) because of its shamanic sounds. In my job or during my studies I worked on great projects, but none of them had a spiritual meaning or aesthetic. I’ve always had a wish to insert spiritual contents in a pure visual form, almost abstract and without using words in videos. So, for me shamanism is the perfect subject. During a shamanic experience (not necessarily using drugs, but only drum or dancing) someone can get information, not in a literal form but through images or sensations. Maybe that’s the reason why there are many symbols in old mythologies. This is the kind of feeling I wanted to put in a video, I wanted to use visuals to deliver a spiritual feeling. In this video there is a mix of old and existing symbols and symbols of my creation. Even if those symbols come from very different times and places, I find them very similar. They are very simple and naïve but they have the power to connect you to something very old and ancestral. They don’t interact with your intellect, but they go deeper. It’s as if they could activate an unconscious force. I also wanted to represent the sacred feminine and its connection to nature and earth. I think that the dance is a visual form that can perfectly express this. The dance allowed me to do a fluid and dynamic video, and not only to show static symbols. I tried to create a unity between the symbols, the music, the dancing and nature, to make a very alive and organic video. In the same way, during a shamanic experience, things are connected but always changing: what is usually hidden to the eyes becomes manifest. At the end of the music video the dancer completely merges into this unity. So I hope that the video works on the viewer’s unconscious and that, in some way, it connects him to the invisible aspect of nature. I don’t know if I succeeded in this task, I’m still a young filmmaker and this is one my first works. I see that there are still a lot of mistakes in the video. However, I hope that in the future I’ll make other better videos. I would like to make videos that have a real impact on the viewer, as if they were spells. A little bit like Lynch’s or Jodorowsky’s movies. We’d like to thank Thomas for taking the time to let us in his head to experience what he did while making this video. We now present the video for ElectraChic’s Erde/Terre, Enjoy!! Jennifer Sacasa-Wright is an Eclectic Witch who runs PaganPagesOrg eMagazine. She has many opinions, thoughts, & suggestions, and, at times, has problems holding her tongue. She loves hearing your opinions and thoughts on the magazine and welcomes comments.